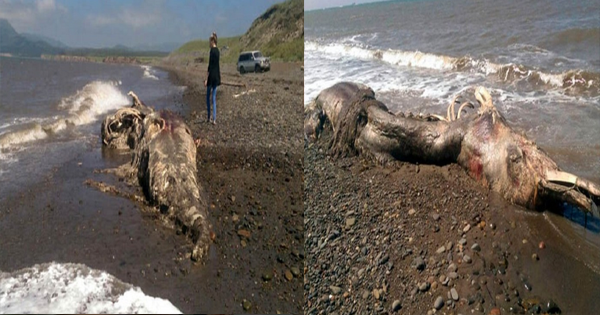 Another mysterious sea creature found dead and washed ashore on a Russian Beach. But this Sea monster confused the scientists because of the Fur on its tail and it has the same beak which is similar to birds. Scientists have yet to identify the strange prehistoric like mutant, which has some similarities of a dolphin, but twice as large as a human. The characteristic of this creature has puzzled the Marine Biologists. Head Deputy of the forecasting Department, Sir Nikolay Kim said that he believed it to be "some big dolphin". He even said that it is one of the rare species due to its skin characteristics. He said that maybe, the animal was brought by a warm current and he's in doubt that it is living in the same area. The identity of this astonishing sea creature still remains a mystery, and I know that there are unknown creatures still hiding and waiting for the right time to come out.